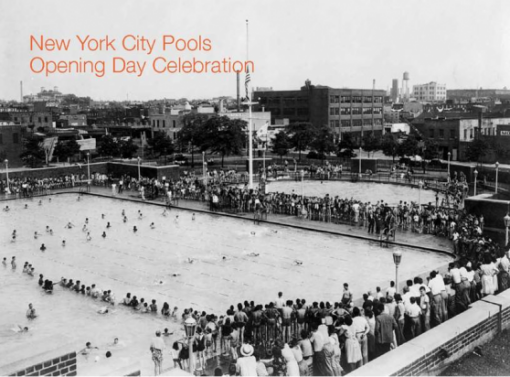 As I pointed out a little while ago, the long decommissioned McCarren Park Pool will officially re-open to the public as a swimmin’ hole tomorrow. If you’re in the mood to rub shoulders with hizzoner, you may still be able to get into the official ribbon cutting ceremony on Thursday morning. Thursday, June 28, 2012 at 9:30 a.m.
After being closed for 28 years, McCarren Pool and Play Center is Mayor Bloomberg’s first PlaNYC regional park project to be completed. The renovated WPA-era facility consists of an outdoor pool with state-of-the-art utilities and an indoor Play Center including gym, cardio and fitness rooms that will operate year-round. Refreshments and music to follow the ceremony. Limited capacity: RSVP to rsvp@parks.nyc.gov.